Ronny Cox is one of Hollywood’s most recognizable character actors. Fans of Stargate know him, of course, as the driven and antagonistic politician Senator Kinsey. But Cox’s impressive list of television and film credits is more than 30 years long, stretching from the 1972 film Deliverance to Our Town, Taps, Beverly Hills Cop, Robocop, and Total Recall. On television, he was Dr. John Gideon on St. Elsewhere, Ellen’s father Franklin on Family Ties, Chief Roger Kendrick on Cop Rock, and briefly commanded the Enterprise as Capt. Edward Jellico on Star Trek: The Next Generation. He’s also done episodes of Alfred Hitchcock Presents, Fantasy Island, Murder, She Wrote, L.A. Law, The Practice, The Outer Limits and much more. He is also a singer-songwriter, and has an official Web site at RonnyCox.com. It is our sincere honor to interview him for GateWorld! GateWorld: How did your casting in the role of Senator Kinsey come about back in the show’s first year? Ronny Cox: The producers just called and asked if I would be interested in doing a show that sort of recapped their first season. We did the show and had so much fun that they and I decided we would like to do more together. Brad Wright told me the show was so successful that every time they got a script from an outside writer, Senator Kinsey was in it. GW: Have you made adjustments to how you approach the character over the years, as the show’s writers have expanded his role? RC: It has been a wonderful, collaborative relationship. They always welcome any ideas I have about the character and they are always looking for new ways for him to grow and become more of a malevolent force on the show. All of us feel that Kinsey is a more dangerous villain on the show because he has an agenda and is truly dedicated to it. Not just evil for evil’s sake or necessarily out for self-serving interests. GW: Do you prefer playing antagonists — or even out-and-out villains — or nice guys? What is it about Kinsey you enjoy the most? RC: I much prefer playing the bad guys. I think they are always the most interesting characters. I liken it to painting: if you’re playing the good guy, you get three colors: red, white and blue. But if you’re the bad guy, you get the whole palette. Also, I spend most of day trying to be as good guy in real life — it’s a wonderful outlet getting to vent all those venal feelings through a character. GW: Kinsey, though, like other characters you have played, is one of those guys who is antagonistic to our heroes — yet is somewhat respectable in pursuing what he believes in. How do you find that grey area for an antagonist who isn’t especially evil? RC: I think the great thing about Kinsey, as a character, is that he is absolutely convinced that he is patriotic, good, and doing the morally correct thing. I think that’s what makes him more dangerous than any other character on Stargate SG-1. GW: We saw a glimpse of Senator Kinsey’s personal life in Season Four’s “Chain Reaction” (his home and family). In shaping the role, have you ever considered what his personal backstory might be (even though the writers haven’t written it yet)? RC: You know, I’ve given very little thought to Kinsey’s home life and his marriage, but a great deal of thought to his personal world view. He is obviously a born-again, right-wing, Christian fundamentalist — very rigid in his contempt for anything that might interfere with those values … dare we say “family values.” One of the guys that I find myself thinking of more and more when I’m playing Kinsey is Sterling Hayden’s scary portrayal of Jack D. Ripper in Dr. Strangelove. GW: You’ve filmed some 10 episodes of Stargate to date. Tell us what your experiences have been like on the set, with this particular set of actors and directors. RC: At the expense of sounding Pollyannish, I have never worked for a TV show that gets “it” as well as these guys do. Everyone is treated with such dignity and respect. I especially hit it off with Rick [Richard Dean Anderson] … perhaps more he than the others because most of my scenes are with him. And because our respective characters despise each other so much, it is only natural that we would personally like each other. I think our politics are simpatico as well.GW: Much of your work on Stargate has been in the form of rather subtle, tense scenes with Richard Dean Anderson. Do you prefer these character-driven moments to the more action-oriented fare? RC: I will always opt for a character-driven scenario. GW: Which episode has been your favorite so far? RC: Picking a favorite episode is a little like picking a favorite child … impossible! GW: Do you prefer acting for television or for film? What inherent differences would you say there are for a performer such as yourself? RC: Not much difference between acting for TV or the movies. A larger difference exists between film work and stage acting. The largest difference is between acting either in films, TV, or stage and performing music on stage. No matter what kind of acting it is — films, TV, or plays — there is, and must be, that imaginary fourth wall between you and the audience. But with music there can be a profound one-on-one sharing. GW: Info on the upcoming episode “Inauguration” is scarce right now, other than that Kinsey plays a key role. What can you tell us about the story? RC: By the time we get to “Inauguration,” Kinsey is vice president — and a little pissed off that he isn’t the president. He tries to push his agenda of having the current personel of SG-1 replaced with people directly under his command. He makes several more enemies along the way, and is eventually forced to resign the vice presidency … but I don’t want to give up too much of the plot. Kinsey makes a play for control of the Stargate program in Season Six’s “Disclosure” (with Garry Chalk as Colonel Chekov). GW: Now that Season Eight has been confirmed and Kinsey is on his way up in the world, have the show’s producers given you any hints about the character’s future? What can you tell us about where Kinsey is headed? 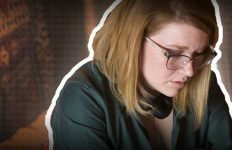 RC: I’m not sure how much I can divulge about where the writers are taking Kinsey next season … but I can say they have some rather important and interesting twists coming for Kinsey next season. It should get very interesting. GW: Your first love is music. 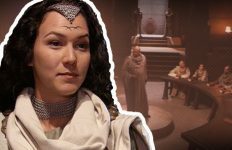 Could you see Kinsey appearing in an all-singing, all-dancing episode of Stargate SG-1? Seriously, tell us about what you are doing on the music scene! Do you perform publicly on a regular basis? Is there another album in the works? Ronny Cox performs on stage at Kerrville in May of 2002. I guess the best way to describe it is as a story concert. Of course, there is music (I have a 5-piece band), but I also tell stories. Some are film and TV stories, some are life stories about growing up in New Mexico, some are about where the ideas for the songs come from … and some are just lies. I found out a long time ago that if I didn’t have a good story for a song, I could just make one up! Now it seems over half the stories in my show are made up. The funny thing is, those seem to be the ones that resonate the most with the audiences. GW: If you were in the shoes of the show’s writers, what sort of Kinsey story might you want to tell? 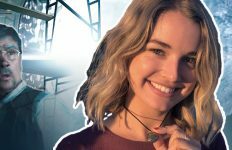 Do you think we’ll get a chance to see Kinsey step through the Stargate? GW: So stay tuned! Thank you again for sharing your thoughts with Stargate fans. We can’t wait to see you in the second half of Stargate‘s seventh season.